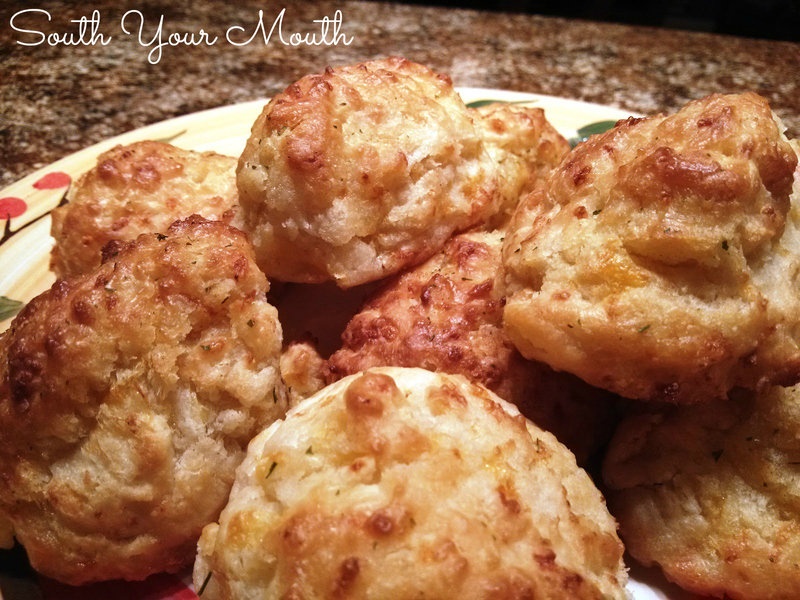 Drop biscuits with garlic and cheddar just like Red Lobster's Cheddar Bay Biscuits. I have a confession to make. And it might change our relationship. Ugh. Here goes… I can’t make Southern style biscuits. I was raised around some of the best biscuit bakers in the South. My Aunt June’s biscuits deserve their own place in the culinary hall of fame. I’ve read a lot about the right way and studied others making them enough that if I were to attempt them again, I’d prolly do alright but I’ve been disappointed and frustrated so many times with failed attempts that I usually just go for drop biscuits (I can make those all day long!) or Cheese Muffins or cornbread. And speaking of drop biscuits (one of my Nanny’s specialties), after eating some Cheddar Bay biscuits at Red Lobster, I decided to try my hand at those. A search online produced 47 gozillion copycat recipes that all looked exactly the same: biscuit mix, garlic, cheddar cheese and melted butter. I might not be able to make traditional southern style biscuits but I've got drop biscuits down to a science and the thing Nanny taught me to do (with any pastry or bread) was to use cold butter. So I decided to use her method for drop biscuits and just add garlic and cheddar. EAU! MAH! GAH! They were amazing! Light and fluffy and tender and totally amazeballs! So, here’s my version of a copycat Cheddar Bay Biscuit recipe using Nanny Richbourg’s drop biscuits. Combine flour, baking powder, salt and garlic powder in a medium bowl and whisk to incorporate. Using a cheese grater, grate cold butter into flour mixture. Most folks use a pastry cutter or fork but Nanny always said that made the dough tough and taught me to use a cheese grater. Gently stir with a fork so that the butter is coated with flour and evenly distributed into the mixture. Add milk and cheese and stir with a fork until just combined (mixture will be sticky but if it won’t come together, add flour, 1 tablespoon at a time). Spray a baking sheet with cooking spray. Drop 1/4 cup-sized dollops of dough onto the baking sheet 2-3 inches apart (I use an ice cream scoop). Bake at 400 degrees for 14-16 minutes or until the biscuits are lightly browned. Meanwhile, combine topping ingredients. When biscuits are done, remove from oven and brush with the butter mixture then serve. *Substitute biscuit mix (such as Bisquick) for flour, baking powder and salt if desired. LOL! I hope they live up to his expectations! No pressure, right?! Thanks for commenting! Making these tonight to go with Kari's Marinade (Trisha's food network recipe) on nice, butcher cut bone-in rib eyes. Grilling asparagus, a couple of small, twice baked potatoes and these biscuits. Can't wait to try them and yes ... at least thinking of going to the gym tomorrow :-). Thank you so much for posting this recipe. Will let you know how they turn out. Don't have any Old Bay Seasoning. Should I try season salt? Or any other substitute? That sounds GLORIOUS! I'm not sure I understand where you're thinking of putting the Old Bay, though?? Just wondering but how does the biscuits get the little speckles of green? Almost like parsley flakes or some sort of herb...possibly the garlic powder? (some garlic powders include sage or some sort of herb)...Just curious! Thanks! There's a 1/4 teaspoon parsley in the topping. These sound great. I too live in the south and for some reason I can't make homemade biscuits OR cornbread!!! However I have a recipe that I taught my sons; 2 cups self rising flour, 1 cup softened butter (not liquidated), and 1 cup sour cream, 1 tsp garlic powder and 1 tsp Italian seasoning (it has thyme, parsley and basil) & 1/2 cup mild cheddar cheese. Mix all ingredients together except sour cream until it looks like sand, add sour cream and mix till blended. Drop "small" baseball size spoonfuls into greased or buttered CASTIRON skillet and bake at 400 until golden brown.